A Margate thief who burgled a Ramsgate home, filling a bag for life with stolen items, and then went on to steal a money bag at Westwood Cross has been jailed for more than two years. On November 5, 2018, Kirk Holt broke into a house in Fitzroy Avenue in Ramsgate while the resident was out and filled a bag-for-life with an extensive list of goods, from watches, gold rings, and sentimental jewellery, to trainers and computer tablets. During the investigation, officers reviewed CCTV taken in the area at the time of the burglary, capturing stills of a person walking to and from the victim’s property with the bag. Then when Holt, of Wherry Close in Margate, was arrested for a separate theft on November 30, he was identified as the burglar. 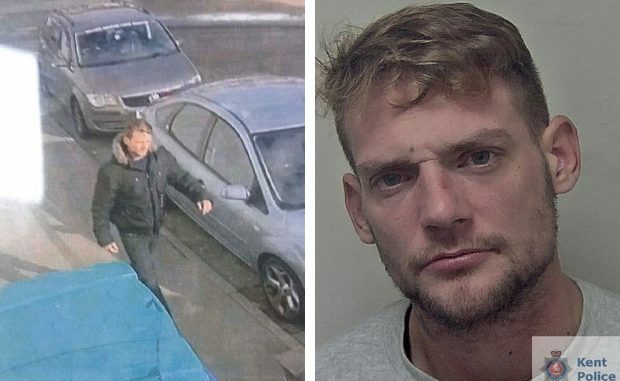 In the later incident, 28-year-old Holt had stolen a money bag from a trader in one of the temporary stalls based in Westwood Cross for the Christmas period. He had also pushed her when challenged and tried to run away. But local PCSOs, who were on patrol in the area at the time, chased Holt and he was caught and arrested. He was sentenced on Friday, January 18 at Canterbury Crown Court after pleading guilty to the burglary and theft offences. He was sentenced to a total of two years and four months in prison. Investigating officer PC Mark Huttley said: “When we receive a report of burglary, as part of our lines of enquiry, we will always see if CCTV is available. “On this occasion, it was once PCSOs had caught Holt for a theft, that our officers saw he matched the CCTV stills from the burglary. With such overwhelming evidence, Holt admitted the offences and was sent to prison.